I haven't done a then and now nail post in a while now but I thought I would try recreating some nails I did back in 2013. I changed up the colour scheme and in the past three years my nails have certainly grown and changed in shape! Back in 2013 I did these nails in a red theme, my nails are clearly too short for the XL stamping plate. Also my stamping on my thumb is exceptionally wonky. 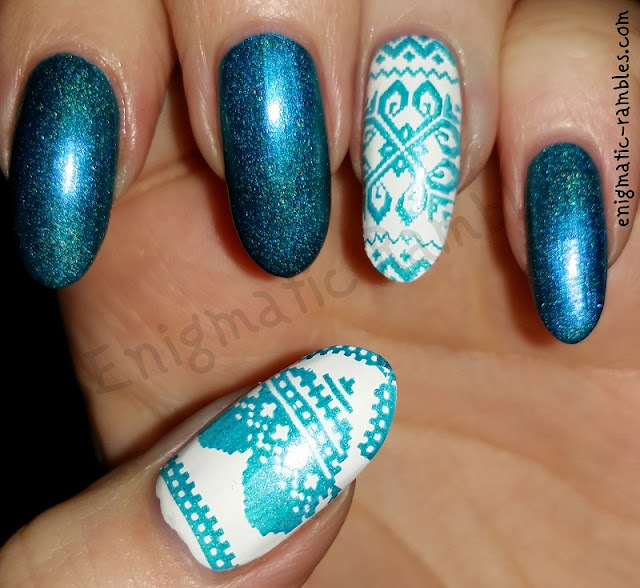 Now I recreated them in a turquoise colour, my nails are the right length for the XL plate. My stamping also seems to be less wonky, although there is a slight bit I messed up but I don't think it is all that noticeable. That and my fingers are ageing too!